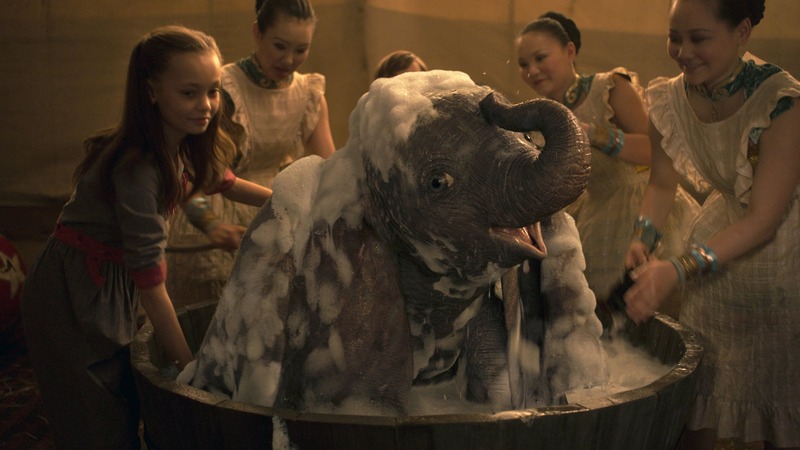 ﻿Another installment in the seemingly endless line of live-action Disney adaptations has just hit the theaters: Dumbo. I recently took my 6-year-old daughter to the screening and am here to give you a spoiler-free review. 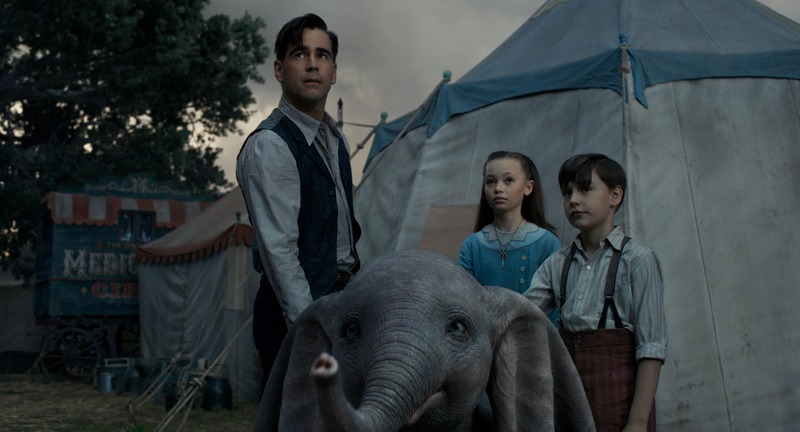 Directed by Tim Burton (Edward Scissorhands, Charlie and the Chocolate Factory, Beetlejuice), this film revisits the classic tale of the young elephant born with huge ears that enable him to fly. First, the good: I like that this film only follows along the path of the original for about the first 30 minutes and then deviates. This first 30 minutes is the weakest point of the movie, but once it goes on it’s own direction, it picks up steam. One thing I never understood about the original story (and the beginning of this movie) was: why it was such a travesty to have an elephant with big ears? In an industry built on “spectacle” wouldn’t having such a rare elephant in your circus be a GOOD thing? It just never made much sense to me. 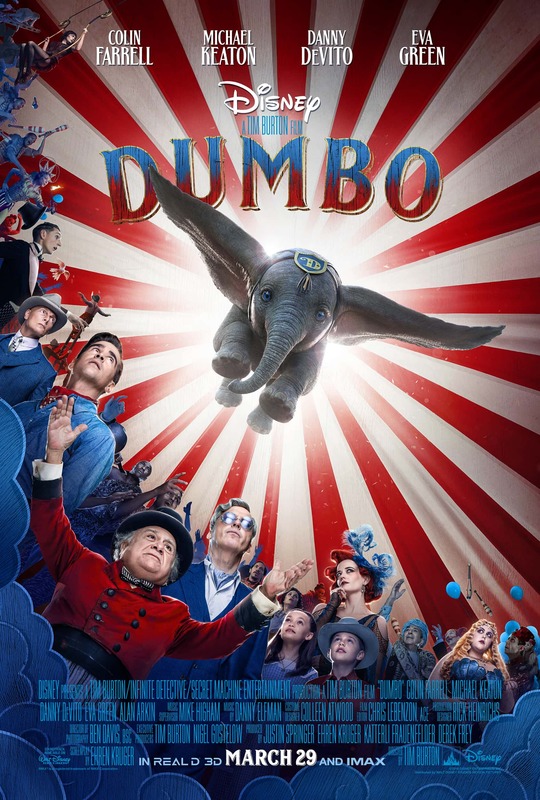 Luckily, Dumbo’s talents are discovered much more quickly in this version and then the plot focuses on exactly what to do with him now that everyone knows he can fly. This is a much more interesting story. Without giving away spoilers, the story has all the common ingredients I’m sure you can predict: a double cross, children dealing with a lost parent, a chance for redemption, an escape plan, etc. These movies are like baking a cake, except that instead of eggs, flour, sugar and yeast, you add these plot points. It’s paint by numbers storytelling and, frankly, I’m tired of it. And, with Aladdin coming around the corner quickly, there seems to be no end in sight. If they can’t remake these “classic” tales in an original and engaging way, they should probably just leave them alone. But Disney won’t do this, because they know, no matter what, you’ll probably take your kids to them. 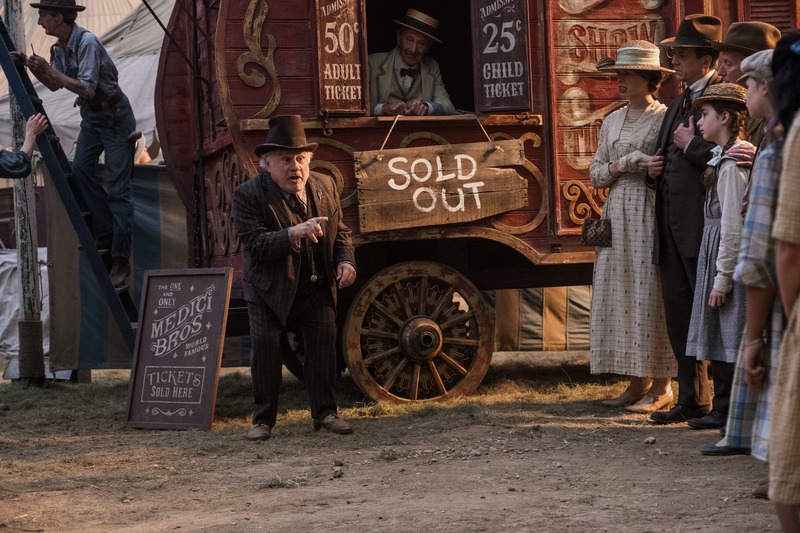 The cast was all over the place as far as performances go: Danny Devito was fantastic as Max Medici, the head of the circus. Michael Keaton played V.A. Vandevere, the antagonist of the story. Keaton, one of my favorite actors, seemed to be just doing an impression of a generic bad guy rather than actual acting. Colin Farrell portrays Holt Farrier, the father of two children who has just come back from the front lines of World War I. But Farrell, another solid actor, just couldn’t seem to muster up the emotional horsepower to convince me to root for him and his dodgy (Texas?) accent. Eva Green rounded out the adult cast by doing a great job playing a, ummm…. trapeze artist?…. with a heart of gold. I would note that it is definitely rated PG. A character is killed off (in a fairly painful way) in about the first 15 minutes. There is also a plot to kill Dumbo’s mom that is plainly plotted out. There are some scenes that may be a little scary for young ones. But my six-year-old didn’t seem to phased by them. My older son, who DOES NOT like clowns, declined to even go see this film. For those scared of clowns: there ARE clowns in this movie. Of course, there was a happy ending, but I’ve thought about it for a couple days and I can’t even come close to understanding the mechanisms in place that allowed it to happen. The movie offered no explanation on how it actually ended up where it ended. Honestly, I have no clue. Also, aside from a few shy pokes at the beginning, the movie simply wasn’t funny at all. Nor did it really seem to try to be. I’m not saying this is a good or a bad thing. I’m just pointing it out. It is, after all, a Tim Burton film. My daughter, who has a healthy sense of humor, never laughed one time during the movie. Otherwise, I found the movie visually beautiful. Tim Burton definitely knows how to design an engaging, magical world that is all his own. I thought the elephants, especially Dumbo, were very well done. Because there is no anthropomorphism going on here and no talking animals, it was imperative that Dumbo was able to express everything with his eyes and body language. Tim Burton was able to to achieve this. But, if you are a parent like me, you are probably simply wondering if you should take your child to see this. My answer would be: if it’s a rainy day on Spring Break and there is nothing else to do, then sure. But the most telling review should come from my daughter. As we were walking out of the theater, I asked her what her favorite part was. She looked confused as she tried to think of something. After waiting for a while with no answer, I simply asked her if she liked it. She just looked up at me and shrugged. Dumbo hits theaters everywhere on March 29th.